Ah, the linga. You just gotta love the Hindus for their fascination with the phallus. There were pedestals/receptacles in almost every temple. 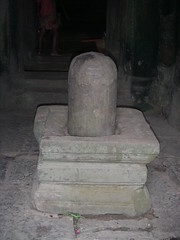 A linga was inserted into the opening and then water was poured over it. The water was then fertile, powerful, magical, reverse-osmosised, or whatever. It could then be used in rituals. People still poured water over these and sprinkled themselves with it. About 80 km outside of Siam Reap there is a river called the river of a thousand linga. 1000 linga were carved into the stone river bed to fertilize the water as it flows downstream. Now that is agriculture!